Is Great Grass Artificial Grass suitable for children & pets? 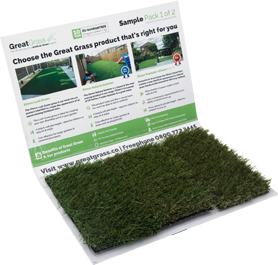 All the Great Grass products have been designed with children & pets in mind. Not only do our products look & imitate natural grass almost identically; but they are soft and hard wearing which is why are products are used in hundreds of schools, dog runs & catteries throughout the UK . Can it be laid directly onto hard decking / hard surfaces? All the Great Grass products can be laid directly on to a hard surface and decking. If you are laying on to a hard surface like concrete; all you have to do is cut it to shape (join if necessary) and glue around the edge. If you are laying on to decking. Again all you need to do is cut to shape (join if necessary) and screw it down around the edge. Domestic customers: Delivery times depend on the weight of your order. Standard orders under 60kg will usually be delivered the following day (excludes weekends) if ordered before 10 am. Standard orders over 60kg will usually be delivered with in 3-5 working days. We are unable to specify a delivery time on Standard delivery services; deliveries will be completed between 9 am and 6 pm. Commercial customer will be entitled to the standard delivery times; however our commercial team can discuss your options if you do require your order more urgently, please contact the Great Grass commercial team for assistance. Artificial grass is low maintenance. Any company or installer who suggests any type of artificial grass is maintenance free is poorly informed. Artificial grass requires a good brushing every 2-3 weeks to ensure a build up of naturally occurring moss does not take a hold of your grass. We will point out that with the correct installation of the grass and this little amount of maintenance your artificial grass will look great for years to come and 10 minutes every 2-3 weeks is a lot less maintenance than mowing, weeding, fertilising natural lawns. Your grass will be greener on your side of the fence… all year round! Artificial grass is available direct from Great Grass on a speedy delivery service as standard, telephone 0117 205 0470 to order or enquire about any of our products. Great Grass accept all major credit cards, PayPal and bank transfers. Prices are all inclusive of VAT. If you visit the showroom in Failsworth Manchester; you are able to pay with cash. All of our artificial grass lawns; expect the budget grass is suitable for pets. Our products are rigorously tested to UK & European standards. We have also sold our products at the world famous Dog Show Crufts and our products have been used in numerous kennels throughout the UK. There are two options available for you. You can either let nature take it’s course (i.e let the rain clean it!) or you can simply wash it down with a hosepipe. To keep your lawn looking brand new, we recommend giving it a quick brush once every 6 months. This keeps the pile standing up and looking clean. If you have pets which use the artificial grass; you can simply remove the mess and easily wash away with warm soapy water. Technically you can, but we would strongly recommend following our simple step by step Great Grass artificial grass installation guide. Following our installation process will ensure that your product can be installed once and remain trouble free for many years to come. The artificial grass has been designed to be easily installed DIY. Some people may ask for the assistance of a landscaper to prepare the ground work for them. However; the installation of the artificial grass is straight forward if you follow the step by step Great Grass artificial grass installation guide and use the recommended equipment. No. Great Grass issue a minimum 10 year UV guarantee on all our products except the budget grass. We can do this because the fibres have been UV stabilised to comply with quality standard BIN53387. Although artificial grass may be a new product to the UK market, our artificial grass has been used in Australia, South Africa and the US for many years. All of these locations have a very high UV index nearly all year round; much higher than what our British Summers could throw at it. You can call us on 0161 685 0071 or email us at info@greatgrass.co for professional advice. I'd like to keep in touch with Great Grass?